Quilt provides versioned, reusable building blocks for analysis in the form of data packages. A data package may contain data of any type or any size. 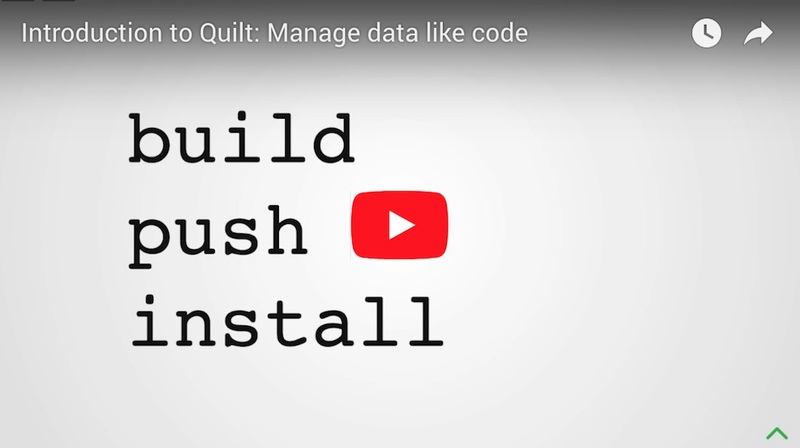 Quilt does for data what package managers do for code: provide a centralized store of record. Reproducibility - Imagine source code without versions. Ouch. Why live with un-versioned data? Versioned data makes analysis reproducible by creating unambiguous references to potentially complex data dependencies. Collaboration and transparency - Data likes to be shared. Quilt offers a unified catalog for finding and sharing data. Auditing - the registry tracks all reads and writes so that admins know when data are accessed or changed. Less data prep - the registry abstracts away network, storage, and file format so that users can focus on what they wish to do with the data. De-duplication - Data are identified by their SHA-256 hash. Duplicate data are written to disk once, for each user. As a result, large, repeated data fragments consume less disk and network bandwidth. Faster analysis - Serialized data loads 5 to 20 times faster than files. Moreover, specialized storage formats like Apache Parquet minimize I/O bottlenecks so that tools like Presto DB and Hive run faster. 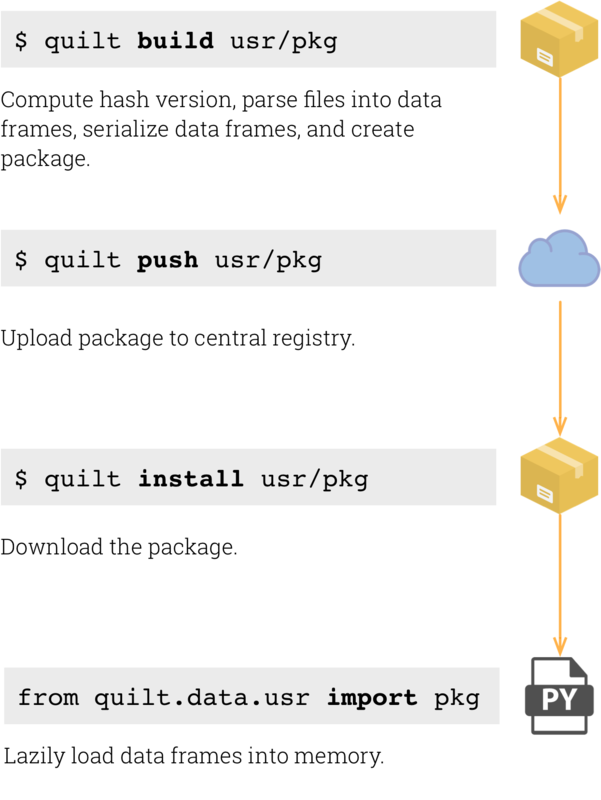 A Quilt data package is a tree of data wrapped in a Python module. You can think of a package as a miniature, virtualized filesystem accessible to a variety of languages and platforms. Each Quilt package has a unique handle of the form USER_NAME/PACKAGE_NAME. 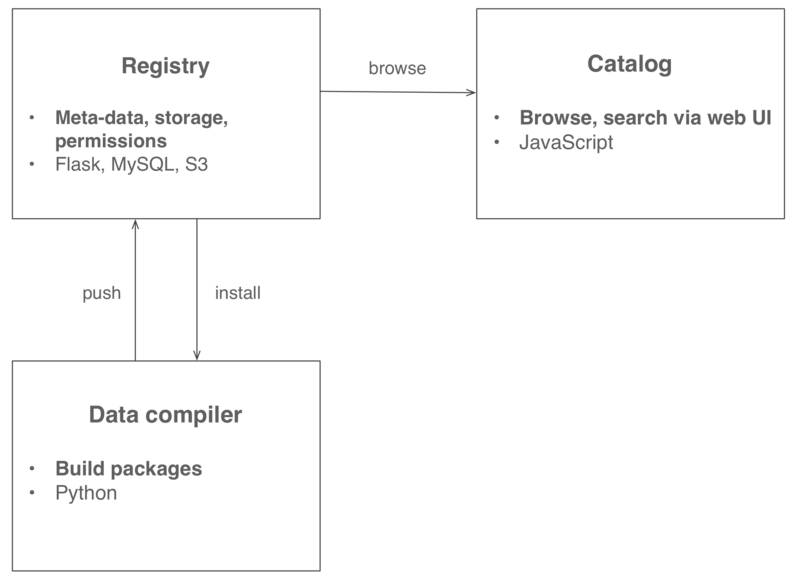 Packages are stored in a server-side registry. The registry controls permissions and stores package meta-data, such as the revision history. Each package has a web landing page for documentation, like this one for uciml/iris. The data in a package are tracked in a hash tree. The tophash for the tree is the hash of all hashes of all data in the package. The combination of a package handle and tophash form a package instance. Package instances are immutable. Leaf nodes in the package tree are called fragments or objects. Installed fragments are de-duplicated and kept in a local object store. build hashes and serializes data. All data and metadata are tracked in a hash-tree that specifies the structure of the package. You may override the above defaults, for example if you wish data to remain in its original format, with the transform: id setting in build.yml. Packages are registered against a Flask/MySQL endpoint that controls permissions and keeps track of where data lives in blob storage (S3 for the Free tier). After a permissions check the client receives a signed URL to download the package from blob storage. Installed packages are stored in a local quilt_modules folder. Type $ quilt ls to see where quilt_modules is located. Quilt data packages are wrapped in a Python module so that users can import data like code: from quilt.data.USER_NAME import PACKAGE_NAME. Data import is lazy to minimize I/O. Data are only loaded from disk if and when the user references the data (usually by adding parenthesis to a package path, pkg.foo.bar()). Quilt is offered as a managed service at quiltdata.com. Alternatively, users can run their own registries (refer to the registry documentation). Quilt consists of three components. See the contributing docs for further details.